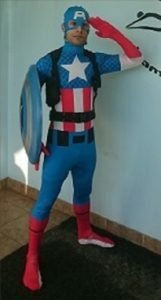 Get a friendly and professional team of superhero entertainers at Right Choice Entertainment Ltd. We strive to provide the best superhero characters for all types of parties. 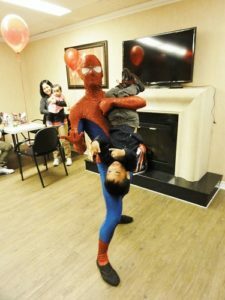 Whether you need to entertain a group of kids during a birthday party or host a large guest size, we’re happy to customize our superhero party service to meet your needs. We have highly experienced and passionate performers to amaze everyone who is in attendance. We will design activities that are fun and entertaining to both kids and adults. If you want to keep the kids busy during your next party, hire our superhero entertainers and they’ll customize everything for you. We can incorporate other services such as face painting to make the superhero party even more appealing. We’ll put a smile in their little faces by painting them their favourite superhero. Begin by giving the guests a hint of what the party theme is when sending out invitations. Don’t give it all away by sharing all the details of the party. You could have custom invitations made with a picture of the child dressed in their favourite superhero costume. Simple invitations like a newspaper cutting that says ‘welcome to the epic battle of good vs evil’ will go a long way in making kids look forward to the upcoming party. The key here is to personalize the invitations as much as possible, make them bold and bright. Also, ensure the invitations clearly communicate the superhero theme. Start with decorating the entrance way and giving people an idea of what the party theme is before they walk inside the venue. For instance, you can hang up spiderwebs and use balloons in the colours of your favourite superheroes all around the room. 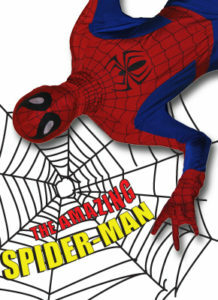 You can also invest in posters of superhero characters as decorations in the venue. You can combine party supplies with homemade decorations to keep costs low. Another simple idea is to take cut outs of the superhero and stick them on the walls and flat surfaces. Get creative with tablecloths and see how you can make them stand out with the superhero theme in mind. When choosing food items to serve at a superhero party Toronto, try and go for food that blends with the party’s colour scheme. You can have fun food options such as snacks and cupcakes which can be customized with superhero elements. Don’t forget to include some fresh juice and sodas in your menu. For things like the cake, candy buffet and ice cream, use the superhero colors to inspire your flavour choices. If you’ll be displaying the foods in containers, make sure they are color coordinated to give you a consistent theme throughout. Super hero parties are incomplete without face painting. This is an amazing activity that will put a smile on the little one’s faces. You can decide which famous superhero symbols to paint on the face of the kids or just the cheeks. 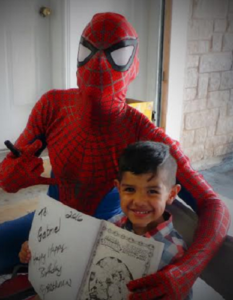 At Right Choice Entertainment, we have talented face painting artists to make kids look like real superheroes. Our face painting artists use high-quality FDA approved face paints which are safe and ideal for kids. 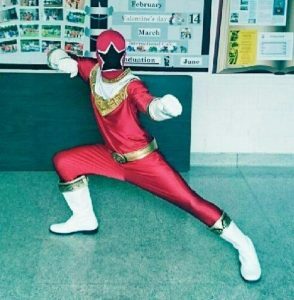 Another activity that the kids would love in a superhero party is wearing different costumes and transforming themselves into real superheroes. 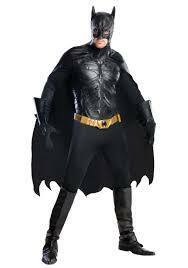 You don’t have to buy all these different superhero costumes. 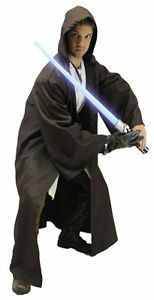 You can always rent costumes that will be used on the party or make something on your own. For instance, you can make belts, capes, and masks and add superhero stickers to give them a personalized touch. Parties are incomplete without favors. When it comes to superhero parties, you’ve got so many options of party favors to choose from. From little superhero stickers to comic books and flashlights, there are so many affordable party favors to choose from. You can also make superhero accessories using balloons. Other favour ideas include superhero headbands and swords which are quite easy to make. 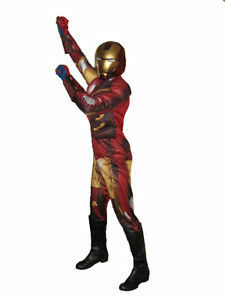 You may want to include bouncy castles or even a fat clown at the party, but this may not suit a superhero theme. We would recommend hiring our performers to provide quality and fun superhero-inspired entertainment. They will come dressed in superhero costumes and give kids clues that they can follow to save the day. 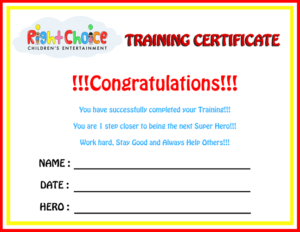 Our superhero entertainers can also help implement a battle that keeps kids engaged the whole time. Two superheroes dressed up in real costumes go head to head or tell a story to keep the kids attentive while the adults enjoy their drinks. After that, the superheroes will be ready to take pictures with the kids and make special memories. Is your child a superhero fanatic? 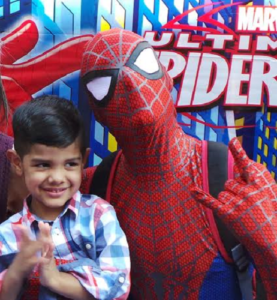 No one knows your child more than you do and if he/she is a superhero fanatic, we have lots of options to celebrate their birthday in style. We’ll help you put together a combination of decorations and activities that bring joy to your event. Just make sure you have a camera ready to capture great memories. We’ll show you how to throw the best superhero party with great performers in Toronto. We know superheroes have been around for the longest time. Every kid fancies a superhero or two. Now it’s your chance to make their dream come true by hosting a superhero party that keeps their friends talking for a long time. Let us help you make your child’s next party an instant hit.